Crimea & Ukraine: Turbulent times - Ultra International B.V.Ultra International B.V.
Let’s be honest, when we were back in San Francisco last year how many of us knew exactly where Crimea was, let alone knew what a valuable contribution this region has made to our industry over the last past few decades? 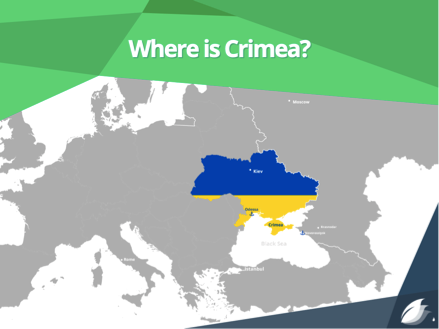 However, for all the wrong reasons, Crimea has become a household name during 2014 but underneath all the headlines, what are the challenges facing this region and what is the future outlook for this once thriving territory? Today we are not here to decide whether Crimea is part of Ukraine or Russia and we are not here to express our political views. Nor are we here to predict Crimea’s political future or debate how Crimea will play into the various leaders’ plans as the pawn it is likely to be in the coming months, as everyone looks for political solutions for Ukraine. 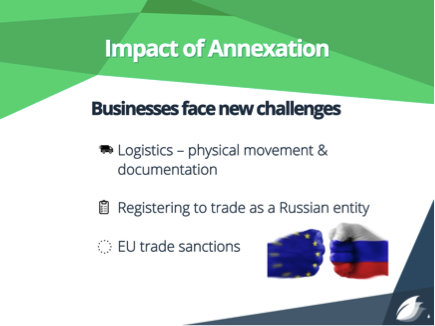 Today we are here to look at what impact the Russian annexation of Crimea could have on our industry and understand how these changes could affect some key raw materials for the flavour and fragrance markets. To better understand today’s contribution we will start with a brief historical overview. We will then look at more recent production trends and then the immediate challenges facing the region. 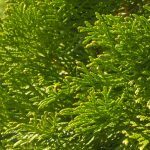 Many may be surprised to learn that during Soviet times the output of essential oils from Crimea was even more significant than in more recent years. Furthermore Crimea also has its own Research Institute of Essential Oils, one that continues to exist to the present day. During the Soviet era Crimea was the centre for all Soviet essential oil production. Specialist machinery was designed and built in the territory ranging from harvesting to sophisticated distillation equipment with as many as six significant extraction plants in operation. As with all Soviet industry it was a closed market with Crimea almost single-handedly supplying the Soviet perfumery and cosmetic industry. At its peak, Crimea produced as much as 40MT of lavender oil (Lavandula angustifolia) and had collections of up to 100MT rose petals per day! You can imagine that with all this consumed internally the perfumery and cosmetics business within the Soviet Union during this time was very significant. After the collapse of USSR (the Union of Soviet Socialist Republics) in 1991, the essential oil market in Crimea almost disappeared overnight, like so many other industries. Open borders and the collapse of other industries meant the customer base simply ceased to exist. At that time the idea of participating in an international environment in which democracy, human rights, and a market economy had proved a successful and efficient formula was alien to many. Post Soviet businesses now had to be measured by their own commercial value, rather than being in a closed economic environment without those past guarantees that your products would be consumed internally no matter how viable your business was. For the first time, real supply and demand was playing a major role along with new competition from outside the Soviet borders. To put this into perspective the relative output cost of coriander seed oil towards the end of the Soviet era was estimated to be around USD 90.00/kilo. Maybe that is not a bad price today but at that time the global market was most likely trading at a third of this price! Production from the two main production centres would have amounted to 1,000MT in any given year, almost 10 times greater than today’s figures!! Essential oils were a huge industry. Both the market and demand were very large, far greater than today where we have more choices in our formulations – synthetic molecules, natural isolates, specialty products and even lower cost centres than those available for Soviet business during this time. So imagine what happens when you remove the borders and for the very first time synthetic linalool can be imported and used in perfumery as an alternative to coriander seed oil? Re-formulations started to happen quickly and the demand for naturals diminished. At the time of collapse it is estimated that there was a surplus stock of coriander seed oil of around 300MT. The international markets collected this oil at a ‘fire sale’ price of around USD 6.00 /kilo, keeping the market price low for years to come!! Many entrepreneurs stood to gain not only from inside the Soviet Union but also from outside too. Some of those may even be in the room today? Following this, in Russia and Ukraine, (as we know them today), almost ALL production of coriander seed oil stopped. What we have in our modern history is a very different market. After the Soviet Union collapse, new smaller businesses started to emerge. Despite the markets being decimated the growing conditions in Crimea were still very favourable to all types of agriculture. A rich and fertile soil, good summers and good spring rains ensured nature could still provide an interesting platform for new businesses to emerge. These conditions appear to have changed for the worse in the past few years with yields suffering year on year as climate changes affected the region. One business we spoke to started to design equipment for a number of smaller producers and in the end this group merged together to become one of the only three meaningful producers to exist in the region today. Between them they have a combination of market knowledge (from outside the past Soviet borders), available land for new plantations and the equipment needed to successfully harvest and distill various crops that were all native to the area. It took several years for these emerging entities to become strong enough to have something meaningful to offer our markets. Developing new business in Ukraine was not easy and still difficult today. Investing in borrowed land at interest rates of between 15-18% is a risky business, as no agricultural land in Ukraine can be privatised. The risks discouraged many investors and realising the potential of these businesses was slow, and dependent on organic growth. Twenty years on and whether we all realised this before today (or this last season), Crimea has once again begun to play an important role in our flavour and fragrance markets. 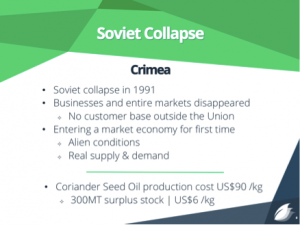 Despite not producing the same range or volumes as in previous Soviet times we can usually rely on Crimea to contribute around 30% of the Russian coriander seed oil output. 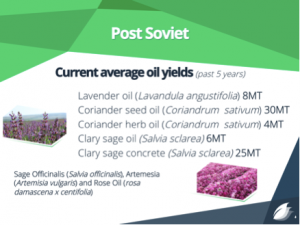 Crimea is also the only notable source of ‘Russian’ lavender oil and the largest contributor to clary sage oil and clary sage concrete from Russia (used for its scalreol content to produce products like ambroxan). Average yields from the past 5 years estimate Crimea’s output of coriander seed oil to be 30MT, lavender oil 8MT, clary sage oil 6MT and clary sage concrete 25MT. Among other products Crimea produces sage oil Salvia officinalis), artemesia oil(Artemisia vulgaris) and rose oil (rosa damascena x centifolia). The annexation of Crimea began in February 2014 following the alleged ‘capture’ of the territory by Russia and the alleged ‘illegal’ vote for independence. We can have whatever opinions we want on the situation (and believe me if you want a debate on this another time just let me know) but the net effect of what happened has left Crimea as an ‘occupied territory’. A territory the western world does not recognise and the economic sanctions from the USA, Europe and Australia, ensure that any trade with the area becomes a real challenge. On March 17, the Crimean Parliament declared independence from Ukraine and asked to join the Russian Federation. On March 18, Russia and the separatist government of Crimea signed a treaty of accession of the Republic of Crimea and Sevastopol into the Russian Federation. 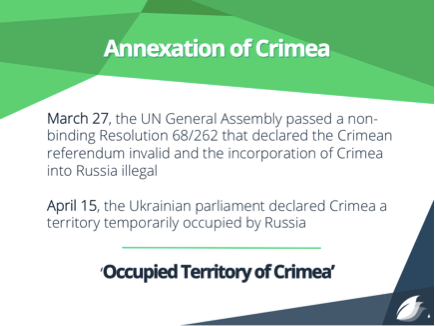 On March 27, the UN General Assembly passed a non-binding Resolution 68/262 that declared the Crimean referendum invalid and the incorporation of Crimea into Russia illegal. On April 15, the Ukrainian parliament declared Crimea a territory temporarily occupied by Russia. The results of the referendum reflected an overwhelming people’s choice in favour of independence with the prospect of becoming part of the Russian Federation. Apparently over 1 million votes were counted and verified within minutes of the polls closing with the government claiming a 96.6% vote in favour of independence. How many actually voted and for what outcome, I guess the world will never know. Seemingly pre-determined, the results appeared compelling and were taken by Moscow as a clear sign of the people’s choice. As far as Russia is now concerned, Crimea is part of their Federation, something only Russia believes, while the rest of the world including Ukraine sees the referendum as illegal. Today we have to deal with the ‘Occupied territory of Crimea’. In the fall out of Euromaidan in Kiev and the annexation of Crimea, businesses now face several new challenges. Logistics – How do they physically move goods off the peninsula with goods blocked from moving through the mainland of Ukraine and Crimea being landlocked? How to re-register with the new authorities their businesses and secure new banking and finance after all Ukrainian banks closed in the area? 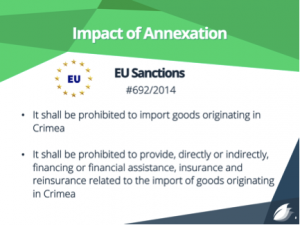 How to deal with the European Union sanctions on trade with Crimea? Logistics are very difficult as most goods that used to leave by sea would have previously been shipped from Odessa port (see map). It is now impossible to move goods into Ukraine and to the port and it is also not possible to transport goods by road into Europe. You can see from the map Crimea’s isolation and the complications caused by this. There is no cargo port in Crimea, only a small ferry service from the far east point to the Russian mainland near Krasnodar where at times over the summer queues reached 14km (approximately 2 days to pass). From here goods can be transported by road around Ukraine into Europe through Belarus or to the port of Novorossiysk in Russia. Both add time and costs to the shipping process with almost no transport companies in Russia electing to service Crimea. Next are the things we perhaps do not think about when your territory turns into another one overnight without any pre-planning. Banks operating in Crimea are nearly all linked to the Central Ukrainian banking system. Under Ukrainian legislation they do not have the authority to operate in ‘Russia’ and therefore had to close. Many businesses and citizens had their deposits frozen. Bank accounts were transferred to the mainland and with no lenders established in the area all lines to credit were cut off. [This also affects individuals, as they could not receive salaries until they also opened Russian accounts]. One bank just this week quoted us 24% APR for a small business loan! All businesses need to be set up as Russian entities, a process that did not start until July. Also directors first need to be Russian citizens, therefore forcing people’s hand to take the olive branch gesture from Russia to become one of their citizens. [During this time many international businesses in the territory closed, including shops and restaurants]. Customs are now closed so no clearance within Crimea. Insurances need renewing, new tax authorities, new legislation, new regulations to comply with Russian standards. So many changes that it is almost like starting all over again. So if this is not challenging enough (and we are yet to mention the annual challenges agricultural businesses face year to year) our friends in Brussels may have put the final nail in the coffin with COUNCIL REGULATION (EU) No 692/2014 dated 23rd June 2014. Point (a) importing goods originating from Crimea. Surely that’s it? The EU is no longer a customer for any goods originating in this area. There are ways to get around this I guess. Ship to Russia and get a new certificate of origin? Have the COO not mention the territory of Crimea? Ship using a non-Crimean based company name? Let’s be honest, we can probably find a way but it’s going to be far from easy, as well as costly. Alternatively just ship to clients outside the EU and I am sure the goods will find there way back to clients in Europe who need the material if despite all these extra costs the material is still competitive. So maybe having overcome this with a little bit of creativity how about point (b), to provide directly or indirectly, financing or financial assistance as well as insurance and reinsurance related to the import of the goods (from Crimea)? We have just mentioned that all banks in the area have disappeared and the ones entering Crimea are not prepared to lend money, as there is no credit history. So it would help if Crimean business can reach out to overseas banks or clients who are prepared to pre-finance – but not now! We all need to store the goods, maybe in our own warehouses or in third party storage but can your business or warehouses obtain insurance if it is found that goods originate from Crimea? Exactly what will happen to the goods when they cross the border into the EU? You can see that there is likely to be some trial and expensive errors in the coming weeks and months as this year’s harvests start to make their journeys around the world. Also there are some date factors to consider. Older contracts are not affected by the EU sanctions if made before June 25th and ‘completed’ by September 26th (this Friday after the conference). However the definition of ‘completed’ is unknown – is it shipped, received, invoiced, paid. It is not clear. Now the question is how to make new contracts today. On what terms can they be made? Shipped to and from where? After all these considerations will the producing company in Crimea have the means by which to produce and operate? Then what next? Every couple of weeks, new sanctions by America, Europe and other Western countries are inflicted. The trouble in the east of Ukraine remains precariously positioned and if one day Ukraine fights for the right to control Crimea again by whatever legal means it can, could ensure that these problems, however new, are not going to solve themselves quickly. Since the Soviet era it is fair to say that Crimea, along with other parts of Ukraine have not enjoyed the most prosperous journey. Business has been challenging amidst a mix of regimes involved in every part of the process, some of which languish behind modern times and have a distinct sense of Soviet/communistic influence. Tax laws, banking and other national and central authority processes seem over-complicated with corruption still clearly seen on a daily basis. There has always been little help for businesses, especially those highly dependent on exports, and now Crimea is known as an occupied zone, label­led by Brussels as a guilty party in its annexation rather than the victim. It appears unlikely that businesses in the region are going to be able to relax soon. So does Crimea have a future as a raw material supplier to our industry? Time will surely tell but with all this let us not forget Crimea’s important contributions to date.